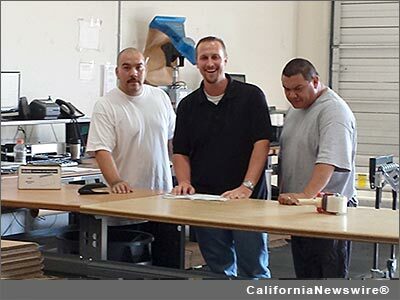 ONTARIO, Calif. /California Newswire/ — When S & S Trucking expanded its warehouse operation to Ontario, it needed to hire skilled employees to open the new location. The expert recruiters at the County of San Bernardino Workforce Investment Board (WIB) referred two qualified candidates to S & S Trucking as well as provided On-the-Job training funds. These two candidates were hired and have since been promoted. Today they oversee the entire operation as assistant managers. "We are training residents for in-demand job sectors and matching them with employers that provide advancement opportunities," says Sandy Harmsen, Executive Director for the County of San Bernardino Workforce Investment Board. "S & S Trucking exemplifies how proper training creates growth opportunities for both the employee and the company." "We saved time and money by using the Workforce Investment Board's expertise to identify the right candidates," said Justin Roberts, Warehouse Manager. "The no-cost recruitment services delivered excellent employees, who are now leaders for our company." Before the WIB, Roberts was recruiting candidates online, a time-consuming process. The Board's programs provided no-cost applicant screening that limited interviews to the most qualified candidates. In addition to the first two employees, three others were later hired through this process. "In one year, the County of San Bernardino trained 3,300 job seekers for high-demand industries and built relationships with 2,800 businesses," said Janice Rutherford, San Bernardino County Board of Supervisors Chair and Second District Supervisor. "The partnerships formed with local businesses by the Workforce Investment Board are key to building an educated workforce, increasing job opportunities, and promoting business stability and growth in San Bernardino County." For information about the County of San Bernardino Workforce Investment Board's no-cost programs from businesses and residents, contact 1 (800) 451-JOBS or visit http://www.csb-win.org/ . Employers and job seekers who are interested in the Workforce Investment Board programs may call: (800) 451-JOBS or visit http://www.csb-win.org/ . Also follow us on: Facebook www.facebook.com/SBWIB – Twitter @InlandEmpireJob; and YouTube http://www.youtube.com/SBCountyWIB/ .